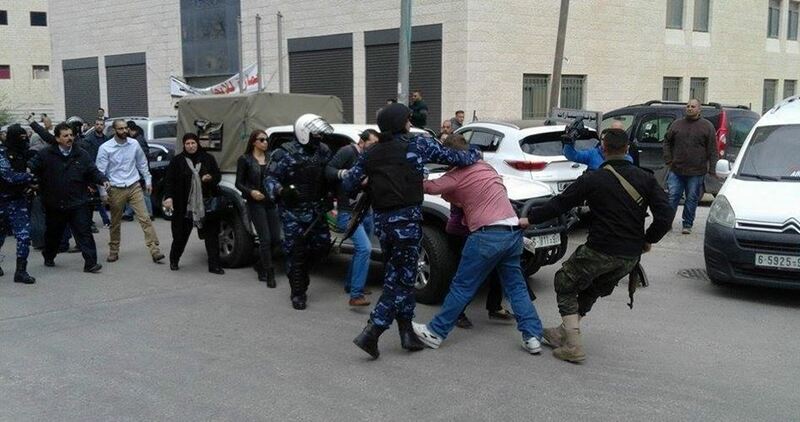 The Palestinian Authority (PA) security forces kidnapped, during the last two days, several Palestinian citizens affiliated with the Islamic Jihad Movement in different areas of Nablus in the West Bank. According to Islamic Jihad, the PA intelligence agency arrested two brothers, Riyadh and Ahmed Da’das, after raiding their home in Nablus on Tuesday. The same security agency also kidnapped another Islamic Jihad member called Salama Abdul-Jawwad from his home in Nablus and confiscated his car. All the detainees had served some time in Israeli jails. In a related context, the PA intelligence has been detaining, with no guilt, two Palestinian citizens from the Jihad Movement for over 15 days and refuses to release them until now. 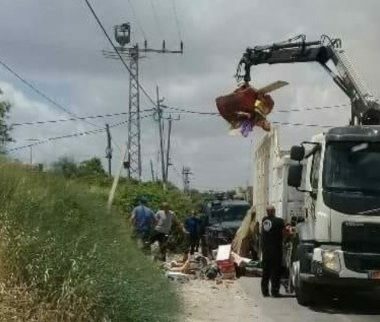 Israeli bulldozers on Thursday knocked down a Palestinian home in Zarnouq village, in Negev, leaving a four-member family without a roof over their heads. Palestinian citizen Mohamed Abu Kweidar said Israeli police troops and special forces, escorted by a bulldozer, rolled into the village at the crack of dawn and demolished the home of his brother Akef, aged 30, under the guise of unlicensed construction. 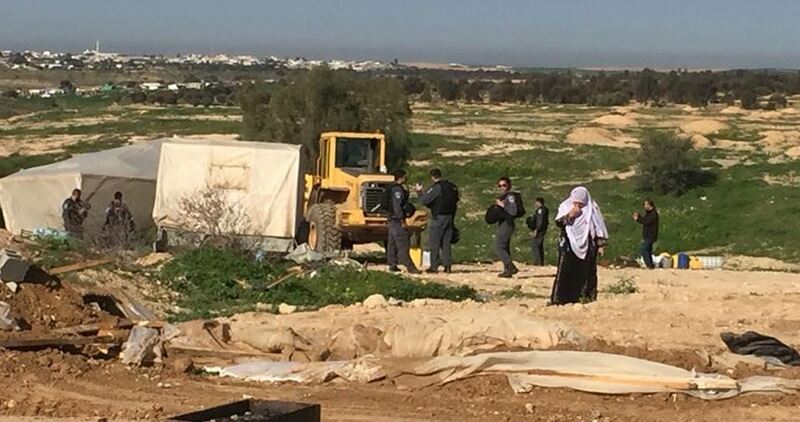 Over the past five years, the occupation authorities have repeatedly turned down Akef’s appeals for a construction permit to build a home for his family. Akef’s expectant wife and his two children used to take shelter in the demolished home. Zarnouq village is one of 45 villages unrecognized by the Israeli authorities in the Negev desert and constantly targeted with demolition and displacement in favor of settlement expansion projects. About 240,000 Palestinians live in the Negev Desert, in villages and communities established hundreds of years ago. Leaked excerpts from a censored Aljazeera documentary, released this week, have offered a glimpse into the workings of pro-Israeli lobby groups in the US. Short clips of the documentary said to be four 50-minute episodes long, reveal a number of prominent pro-Israeli conservative think tanks spearheading a fierce campaign against pro-Palestinian activists. While the full documentary has been censored for now, those who have seen the entire documentary during a private viewing have concluded that details uncovered by the Aljazeerajournalist show examples of possible illegal Israeli spying on US citizens and the lobby’s fear of a changing political mood. International medical relief charity Doctors Without Borders/Médecins Sans Frontières (MSF) has said it is will waiting for Israeli authorities to reveal details about the killing of medic Hani Mohammed Almajdalawi in the occupied Gaza Strip earlier this month. In a statement issued yesterday, MSF noted that “over one week has passed since MSF learnt about the death of [Almajdalawi]”, one of the group’s “Palestinian medical staff in Gaza”. Hani was killed on 20 August by Israeli forces who seized his body and have withheld it ever since. “While MSF representatives have met with the Israeli authorities over recent days”, the statement continued, “we have not yet received information clarifying the circumstances surrounding the death of Mr. Almajdalawi, and therefore cannot confirm the reported versions of events”. According to Israeli authorities, Almajdalawi opened fire on Israeli occupation forces before being shot dead. Since 30 March, MSF said, “we have treated over 1,700 patients, 99 per cent of whom suffered gunshot wounds”, in the context of the Great March of Return in the occupied Gaza Strip. “MSF has tripled teams’ surgical capacity and post-operative care, to respond to the volume of people injured. We currently have four surgical teams operating in hospitals across Gaza, and four post-operative clinics that provide nursing care, physiotherapy and rehabilitation,” it concluded. Some 3,871 Palestinians have been killed in the Syrian conflict since 2011, 462 of whom died due to torture, the Action Group for Palestinians of Syria revealed this week. Almost 2,000 Palestinians were killed due to shelling by the regime, particularly in Damascus after tens of thousands fled the largest Palestinian refugee camp, Yarmouk, which was destroyed in an extensive bombing campaign causing heavy civilian casualties. Hundreds of Palestinians have also died in jails of the Assad regime after being subjected to torture; last month three men, identified as Anas Abbas Awad, born 1990 who was arrested in 2011, and brothers, Mohamed Fayyad Mustafa, born 1979, and Nabil Fayyad Mustafa, born 1980, who were arrested in 2013, were confirmed as dead, having not been seen since their arrest. Numerous Palestinians in Syria are also fighting alongside the Syrian regime in several factions, including the Popular Front for the Liberation of Palestine and the Palestine Liberation Army. Battles between pro-government forces and opposition groups have left dozens dead. Last month, the Palestinian Liberation Organisation (PLO) moved to send a delegation to meet with Syrian officials to discuss the issue of Palestine refugees in the country. Despite the destruction witnessed in Yarmouk, Syrian Prime Minister Imad Khamis affirmed that the government would rebuild it and return the refugees. The PLO has since called for Palestinian refugees who fled the Syrian conflict to register their names in order to facilitate their return to the camps in Syria, despite many fearing arrest or repercussions from the regime. Millions of refugees are also at risk of permanently losing their homes following the announcement of a new law that allows the Assad regime to confiscate vacated property. The new legislation has increased fears that many Syrians may face permanent exile, particularly those who opposed Syrian President Bashar Al-Assad, whilst those perceived as loyalists may be given access to certain neighbourhoods instead. Analysts further suspect that the law has been designed as an instrument of demographic change and social engineering, comparing it to the absentee property law implemented by Israel in 1950 which allowed Tel Aviv to seize Palestinian land. An Israeli soldier convicted of killing a wounded Palestinian youth said that he had no regrets in his first interview since leaving prison three months ago. Elor Azaria shot the Palestinian youth Abdul-Fattah al-Sharif in the head at point-blank range as he was lying on the ground in the West Bank city of al-Khalil in 2016. Azaria said that he behaved in accordance with the training he had received in the army, adding that he continued to do his job, carrying his gun, for a couple of hours after the shooting. Following his release, the Israeli soldier returned to the crime scene in al-Khalil where he was received by dozens of Israeli settlers celebrating his release and chanting slogans supporting him. Azaria was filmed shooting al-Sharif, who was injured, in the head while he was lying on the ground in al-Khalil city in March 2016. The same videotape showed Israeli medical crews refraining from providing first aid to the wounded Palestinian. He was initially sentenced to 18 months in prison after being convicted of “manslaughter”, but Israel’s military chief, Gadi Eisenkot, later reduced the sentence by four months. Israel’s Prime Minister Benjamin Netanyahu and many right-wing Israeli officials supported Azaria and called for executing all Palestinians who carry out attacks against Israeli settlers or soldiers even when they are injured. An Israeli Court ruled on Tuesday that an Israeli colony that was established on stolen Palestinian land can be recognized and legitimized by the Israeli state, thus setting a precedent for further expansion of colonies onto Palestinian land. The Jerusalem District Court issued the ruling, with Judge Arnon Darel agreeing with the Israeli settlers in their argument that they obtained the land “in good faith” – even though the land was, in fact, stolen from its Palestinian owners. The colonial outpost in question is called Mitzpeh Kramin, which was established in 1999 on six plots of land: one of which was owned by the Israeli government (after having been taken from its Palestinian owners in 1948), and the other five of which were owned by Palestinians who held the legal deeds to the land. 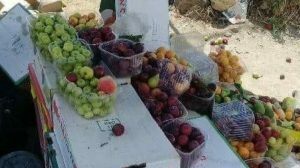 The judge ruled that the residents of Mitzpeh Kramim are the legal owners of the land and that the Israeli Military Civil Administration in the West Bank cannot revoke their ownership. In addition, the judge ruled that the Palestinians whose land was stolen are not entitled to the return of their land. According to the judge, because the colonial settlers moved onto the land “in good faith”, their takeover is legally justified. acording to Ha’aretz, “In 1999, 10 buildings were constructed in what is now Mitzpeh Kramim with permits and help from the government. Since then, more structures have gone up – but without permits. 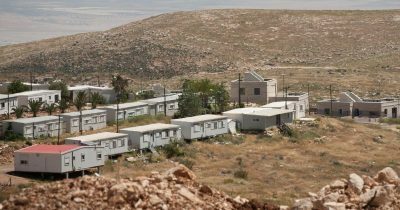 The case sets a precedent for more illegal colonies constructed through the forced seizure of Palestinian land, often accompanied by violence carried out by paramilitary Israeli settlers, to be ‘recognized’ and ‘legalized’ by the Israeli government.